Today the post will be over an edible native to Texas plant, the prickly pear cactus. The inspiration for the post is having seen so many cactus on my adventures here in south Texas. To start with the prickly pear cactus is found all over Texas and I like the sweet taste of cactus fruit. The cactus is almost completely edible. Just don't eat any needles, it can't be healthy for you. Another reason to talk about the prickly pear, resulting from the excessive heat recently, this type of cactus is a hidden source of water. There are 15 species of prickly pears in North America, and each species varies slightly in its features. The prickly pear plant in deep south Texas is green and grows between 5 and 6 feet. In addition, the prickly pear pad grows round and flat and are also known as napol in Spanish. Furthermore, the prickly pear also has two types of needles: long, smooth spines and short, hair-like spines. The short hair-like needles can be difficult to remove. One way is to scrape along the skin with a credit card or the dull side of a knife. This will generally push scrape any short needles out. Last, prickly pears have fruits that range from green (when unripe) to purple (when ripe). The fruits are also known as tuna in Spanish and are covered in both types of needles just like the pads. The prickly pear is edible raw and has a sweet taste. The fruit is ripe and sweet when it is purple or wine-red. In addition, the center of the fruit is full of seeds, which are also edible. Just be sure to remove all needles from the fruit. To prepare, remove all spines, which is done by scraping the fruit with a knife or flat rock. Then slice the fruit in two. Next, if you don’t mind the seeds, eat it. If you dislike seeds, scrape them out and then eat. 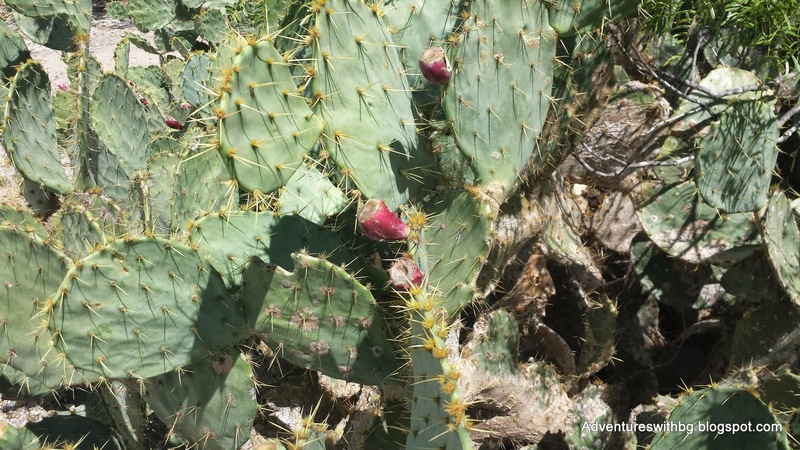 The prickly pear pad is edible raw as well and is a good source of water. The pad is flat, round, and varies in length. Just like with the fruit, make sure to remove all the needles. To prepare, pick a shorter, thinner pad that is stiff, which will be the most tender. Next, remove all the spines by scraping the pad with a knife or flat rock. Then slice the pad into strips. The strips can be sauteed in a skillet or boiled. The pad is very slimy when boiled. If you don’t like the slime, boil the pad, dump the water, and then boil again until tender. In addition to being edible, the pad can be used to hold water and as a cooking pot. I will create a video on this in the near future. If you have any cactus recipes or preparation techniques feel free to share them. Are the other parts of this cactus edible? I know a lot of Mexican recipes have tamales as an ingredient, but I'm not sure if this cactus is one of them. Almost all parts of the prickly pear cactus are edible. I for sure wouldn't eat the needles, small or large. Also, you should leave the roots alone. This will allow the cactus to grow back after its been "harvested". Neat. Also, for some reason I said tamales. I meant to say nopales (cactus).